Taylormotive is the first I-Car Gold Class™ certified professionaly trained I-Car Platinum ™ collision repair shop in North Vancouver. We are also ICBC-accredited c.a.r. shop VALET repair facility. 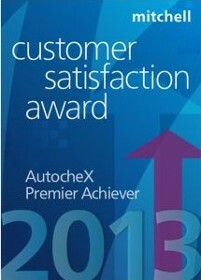 We are thrilled to have achieved the Certifications for the following automaker recognitions with Pro First™ Honda. 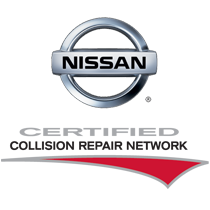 along with Certified Collision Care™ for Mopar Chrysler, Dodge, Jeep, Ram, Fiat, Ford, Lincoln, Nissan, Kia. 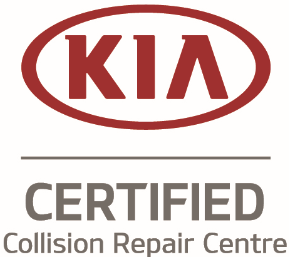 We are ARA Certified Collision Repair™ Gold plus Level Shop, And Certified with Canadian Collision Industry Accreditation Program™. 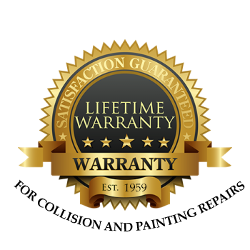 These certifications help to let our customers know they are dealing with highly trained professionals that care about them with the latest certified repair equipment and tools. We assure that your vehicle is repaired right to ensure its safety and performance. We not only specialize in collision repair, but also offer All Make complete mechanical service including oil change, computerized wheel alignment, motor vehicle inspection, and specialize in Tires, Hunter Road Force Balancing, Hunter Hawk Computer Wheel Alignment, Suspension, steering and brake repair. When you need collision repair, mechanical service, or preventative auto maintenance. Call Taylormotive, the # 1 shop for auto repair in North Vancouver. You will be glad you did! 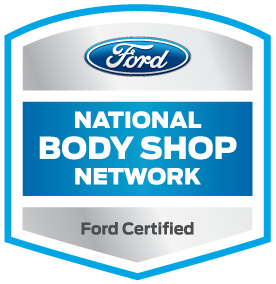 The Gold Class designation lets you know a collision repair shop has trained technicians who know how to repair your vehicle properly. Approximately 10% of collision repair shops in Canada currently complete the rigorous training requirements needed to meet the Gold Class standard. Businesses that earn Gold Class status are proud of their accomplishment and will typically display the Gold Class logo prominently in their shop and on their website to help you identify them as highly trained repair facilities. Taylormotive is the first I-Car Gold Class™ Collision Repair Shop with I-Car Platinum trained professionals in North Vancouver. Under no circumstances are you legally obligated to go to the shop your insurance company may suggest. As the vehicle owner it is your right to choose the collision repair facility that you prefer to repair your Vehicle. Taylormotive is the first I-Car Gold ICBC accredited c.a.r. shop, VALET repair facility in North Vancouver. We also handle private insurance claims, and personally paid repairs. Let us handle anything from a small parking lot ding to a major collision. We specialize in automobile and light truck auto body repairs in North Vancouver. From our latest state of the art certified equipment, to our experienced and highly trained I-Car Platinum Certified Technicians, there is no damage we can't handle. Our goal is to return your vehicle in a timely manner, sparkling clean, in pre accident condition or better with a lifetime guarantee. 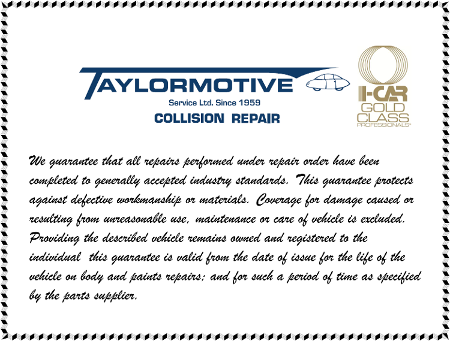 Taylormotive is the first and only I-Car Gold Class™ certified professional collision repair shop in North Vancouver. The Late Don Taylor started Taylormotive with the idea that quality workmanship and trustworthy auto service mixed with honesty would go a long way in the automotive trade. More than 60 years later his principle still rings true with Taylormotive as your top choice for auto repair in North Vancouver. Taylormotive has always put quality and the customer before the bottom line. Not only is Taylormotive an excellent place to have your car repaired, it's also a great place to work. Many of the employees at Taylormotive have been working as mechanics here for more than 38 years. The Taylor Family and Taylormotive are also very generous within the community, supporting various local and national charities. 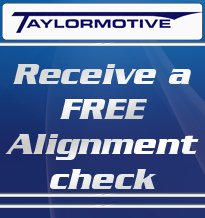 Taylormotive is committed to providing our customers with quality workmanship and trustworthy auto repair service. 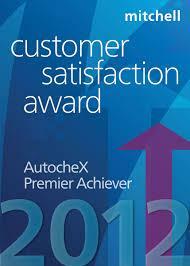 We pride ourselves on having a high customer satisfaction rating. This is why we offer our customers the best warranty in the industry. All of our paint and body repairs are guaranteed for as long as you own the vehicle. 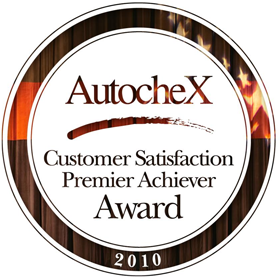 Some of the many auto repair services we offer include Collision Repair, Auto Body Repair, Professional Auto Paint, Transmission Repair, Brake Service, Oil Change, Vehicle Tune Up, Wheel Alignment, Water Pump Replacement, Winter Tire Installation Packages, Strut Replacement, Check Engine Light Service, Timing Belt Replacement, Battery and Electrical Repair.